By now, even those who don’t watch the markets have noticed the epic 75% fall in crude oil. It’s pretty hard to miss given that gas prices’ now start with the number 1, instead of 2 or 4. And most of us are happy about the extra hundred bucks or so to spend each month. Playing a commodity is not the same as playing a stock. Even if you use ETFs instead of futures to gain exposure, the mechanics behind the transaction are still different. There are certain costs that need to be considered. And these costs ensure that whichever way you play it, your percentage gain will probably be less than the actual gain in the underlying commodity. Take a look at what happened to USO, the popular oil ETF, after the 2008 crash. Yes… this chart is correct… and yes, USO only rose about 100% from 2008 lows. That is less than half the amount the price of physical oil rose! So why the discrepancy? How can the price of oil rise from 30 to 110, but USO only gain less than a third of that? Oil is a commodity, not a company. You don’t buy “shares” of oil. Instead, you buy futures contracts on the price of oil. That is of course assuming you don’t have a tanker to buy and store a hell of a lot of the physical black tea. A futures contract is an agreement to buy or sell something in the future. If you’re unfamiliar with the concept of futures, check out our special report on them. USO’s Benchmark is the near month crude oil futures contract traded on the NYMEX. If the near month futures contract is within two weeks of expiration, the Benchmark will be the next month contract to expire. Futures contracts expire. In the crude oil market, they expire every month. This means that if you’re long crude oil futures, you need to “roll” your exposure forward each month. You sell this month’s contract, and buy next month’s. That way you stay long the commodity month after month. The USO ETF is convenient because it does this for you. Simple enough right? Sure is… except for one problem. 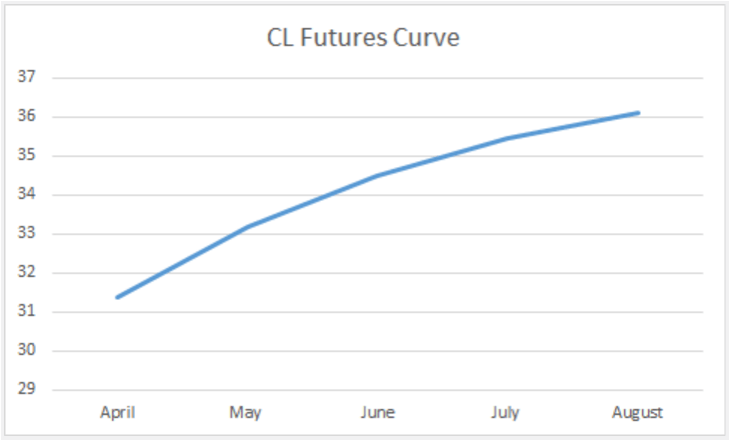 The oil market’s futures curve is normally in contango. This means that contracts expiring further out in time cost more than those expiring sooner. This difference causes you to lose money every time you roll your contract from month to month. The cost difference is due to the “cost of carry” and interest. For example, if you were to buy physical oil, you would have to pay to store that black goodness somewhere. This is what they call the “cost of carry”. With futures you don’t have to store anything. But when you buy the contract, this cost of carry is still reflected in the price. The further out the futures contract, the higher the cost of carry, and the higher the contract price. The same goes for interest. Buying futures is far more capital efficient than buying physical oil. To own a million dollars worth of physical oil, you need to pay a million dollars. But to own a futures contract worth that much oil, you only need to pay about a hundred thousand dollars. It’s a great deal. The cash you save can be used to earn interest on the side through things like treasury bills. But this interest advantage doesn’t come free. Its cost is once again reflected in the futures contract you buy. The further out the futures contract, the more potential interest you can earn, and the higher the contract price. Notice how April contracts trade for $31.50, but May contracts trade around $33. When it comes time for USO to roll its exposure, it will have to sell its contracts at $31.50, and buy more expensive ones at $33. Over time this constant requirement to sell low and buy high erodes returns. Each month an investor has to “pay up a little” to keep his long exposure. This is why USO returned so much less than the actual price of oil after 2008. Buying USO has a cost of carry associated with it. And the longer you hold USO, the more you pay. In the long run this can make a huge dent in total returns, even if oil has a big rally. The takeaway here is that USO is not like a stock where you can buy, shut your eyes, and hope for the best. If oil happens to putz around sideways, your account will get killed from roll costs. 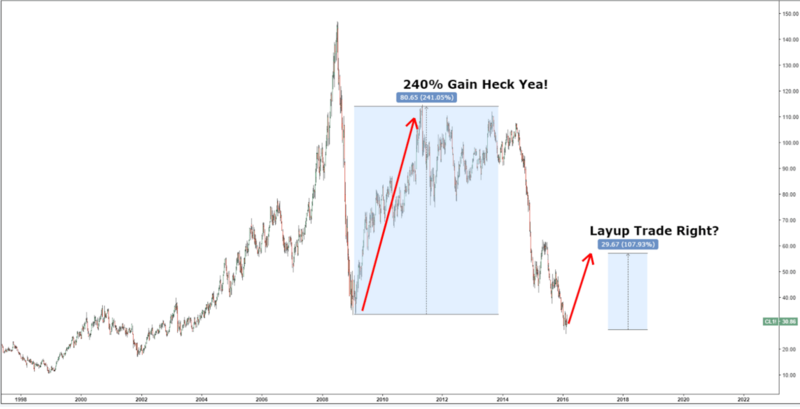 As a speculator, you’re better off learning to trade the oil market on a shorter term basis. Learn to use appropriate price entry and exit signals from a quantitative/technical approach. You need to hit a trend and get out. If you’re feeling extra adventurous, you can buy futures and boost returns even more. And don’t even get us started on the 3x-levered and inverse oil ETFs out there. Those are reserved for only the most degenerate gamblers among us. We’ll save discussing those scams for a later time.